Today is the most important day in the human being life and it comes every year with a huge expectation of beloved one; there is nothing suspense on this, it is obviously Valentine’s day. Most of them waiting for the call from their beloved ones or preparing for the proposal, today if you have looked Google home page you will get surprise because Google also wishes everyone for the successful day and GeekSite too. In home page one guy standing with the documentary film of his love story; if you have click on the play button his story start with Google search and finding a good gift for the girl who is playing rope jump aka skipping rope nearer to the tree.But she haven’t turned her face on his side, he is trying so much by searching in Google to find the best gift for her; he given chocolates, clothes, toys, even balloon too but sadly no progress in relation. He never gets tired; at last he comes with another rope to play with that girl, now she is very happy and both get together. Courtesy: Colombia record’s and Sony/ATV. The first Google Doodle was created by Larry Page and Sergey Brin Google in the year 1998 to mark the celebrations of the Burning Man Festival. 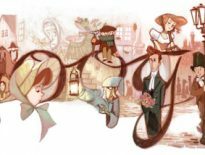 Google currently has more than 1000 Doodles. Google recently announced the revamp of its Doodle site (www.google.com/doodles) which houses all Google doodles since the very first back in 1998.